PHILADELPHIA, PA – July 24, 2017– Janney Montgomery Scott LLC (“Janney”), a leading full-service wealth management, financial services, and investment banking firm headquartered in Philadelphia, PA, today announced that Timothy J. Sullivan, Senior Vice President/Wealth Management; Paul E. Sullivan, First Vice President/ Wealth Management; and Christopher M. Peters, Vice President/ Wealth Management have joined Janney’s West Hartford, CT branch office. 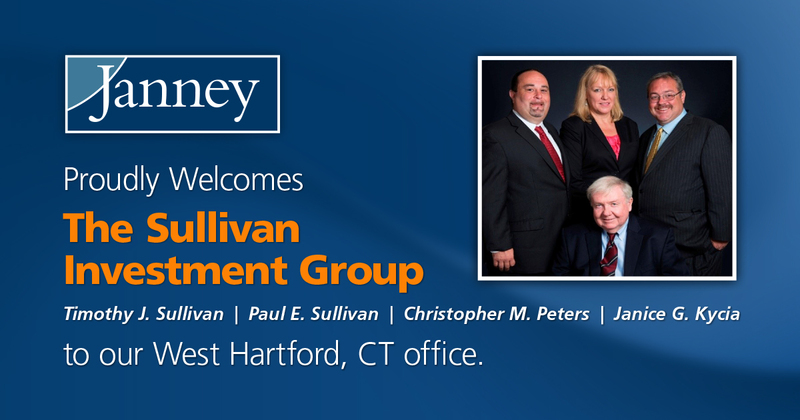 Collectively known as the Sullivan Investment Group, they are joined at Janney by Janice Kycia, Senior Registered Private Client Assistant. The Sullivan Investment Group was previously affiliated with Wells Fargo Advisors. With over 100 years of combined industry experience, the Sullivan Investment Group is entrusted with over $288 million in client assets. The team specializes in retirement plan services for small businesses, corporations, and non-profit organizations. Timothy Sullivan sits on the board of the Boys & Girls Club of Hartford and is a member of the benefits committee of United Way of Central and Northeastern Connecticut. Paul Sullivan and Chris Peters are co-founders of Mayor Mike’s Foundation for Kids, which organizes and supports youth sports programs in the city of Hartford. Janney’s West Hartford, CT branch office is located at 15 North Main Street, West Hartford, CT 06107. Sullivan, Sullivan, and Peters are the 12th, 13th, and 14th experienced financial advisors that Keith has hired into his Connecticut complex in the past twelve months. Janney provides advice to individual, corporate, and institutional clients. Our expertise includes guidance about asset management, corporate and public finance, equity and fixed income investing, equity research, institutional equity and fixed income sales and trading, investment strategy, financial planning, mergers and acquisitions, public and private capital raising, portfolio management, retirement and income planning, and wealth management. Janney is an independently-operated subsidiary of The Penn Mutual Life Insurance Company and is a member of the Financial Industry Regulatory Authority (FINRA) and Securities Investor Protection Corporation (SIPC). Additional company information is available at www.janney.com.